Laundry rooms are no longer an afterthought, having come a long way since they were tucked away in dark basement corners or unfinished spaces. From home improvement sites to remodeling forums, laundry rooms are being discussed as far more than just functional necessities. They’re becoming attractive spaces that make doing the laundry more pleasant and convenient, not only making your life easier but adding to your home’s resale value, too. 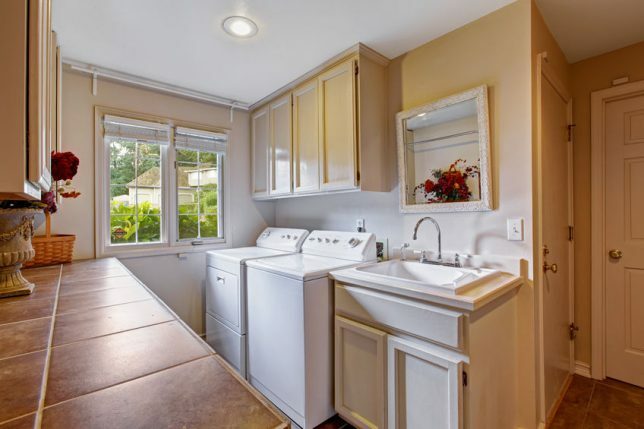 Whether you’re remodeling or building a new home, one way to make your laundry room more appealing is to locate it in a more convenient spot. Placing a laundry room closer to bedrooms instead of in the garage or basement saves both time and steps. Many homeowners are now locating laundry rooms on second or even third floors to be closer to bedrooms, closets or dressing rooms. If space allows, you can modify or build your laundry room so the space can handle all of the steps involved in the doing laundry, including sorting, folding, hanging, and even ironing your clothes. The addition of a utility sink makes it easy to hand-wash delicate clothes and help keep your area clean. Adding a folding station is an easy way to save time and minimize wrinkling. Building in a counter-height table side by side with your washer or dryer makes folding a more convenient task, and you can fit in an under-table storage area, too. Coated wire shelving and coat hooks are also solid additions that help with folding and hanging clothes to prevent wrinkles. An accordion-style drying rack saves space, and can be mounted on a wall for air-drying garments too delicate for the dryer. When not in use, it can fold easily against the wall. And don’t forget ironing. Rather than using a space-consuming free-standing board, you can easily attach a wall-mounted ironing board, keeping the option to iron at the ready. Simple upgrades make a big difference. Keeping cleaning supplies organized is another simple and appealing laundry room design feature. Whether you use built in shelves, organizing bins, a free-standing cabinet, or a Lazy Susan, the goal is the same: Keep everything from detergent to fabric softener sheets in one easy-to-access space. Of course, even doing simple upgrades to your existing laundry room can result in an attractive facelift. Brightening your laundry room with fresh paint for the walls and ceiling, hanging acrylic curtains from rods or utility pipes for a soft wall treatment, or adding color and style to a plain floor with new flooring all create a fresh new look. Think about countertops, too — with relatively few feet of countertop space needed, you can go all out with high-end materials to make your laundry room instantly more appealing. Call on a pro to get the job done right. Whether your new laundry room is a standalone project or part of a larger home remodeling plan, a professional contractor can help ensure you’ll have a space that’s well-planned and built right. At Contractor Connection, we match you with a contractor in your area who has already been thoroughly vetted and whose qualifications have been verified. Best of all, the workmanship of all Contractor Connection contractors is warranted for three full years. Get your project started today by entering your ZIP code above.